THE STEEL KISS, book twelve in the Lincoln Rhyme series by Jeffery Deaver, is a gripping Lincoln Rhyme’s thriller. The plot feeds right into people’s fears. Although technology today plays a large role in everyday life, after reading this, readers will never look on devices the same way. If his goal is to scare the heck out of readers he succeeded beyond comprehension with this novel. The plot begins with New York City detective Amelia Sachs chasing a suspect through a busy mall. As she is about to apprehend him an escalator malfunctions with horrendous consequences, someone is mangled to death. It becomes evident that a person is hacking into consumer products to kill people, and appears to enjoy watching the suffering, either physically or emotionally. Amelia enlists the help of her boyfriend, famous forensic scientist Lincoln Rhyme to assist in solving the crime. They must race against the clock to catch the perpetrator before he hacks into more appliances and the victim count becomes greater. 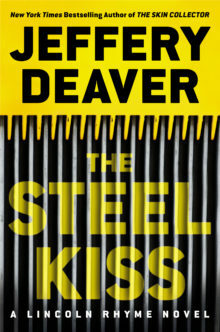 THE STEEL KISS, as with all Deaver stories has the reader holding their breath as they turn the pages. There are many twists and turns that are so clever it will have people going in one direction only to realize they made a wrong turn. Anyone who wants a creepy, riveting, and action packed story should read this one.